Siddhartha Gautam, the prince was born in the Kingdom in Nepal who later found the enlightenment in India and came to be known as Gautam Buddha. Beautiful Buddhist monasteries and stupas over the relics have become an inseparable part of Nepalese & Indian art, culture and architecture. Nalanda was once a world center for Buddhism and its philosophy until it disappeared suddenly in 13th century except for the small kingdoms in the hilly tracts. 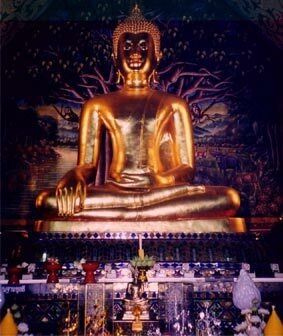 Early 20th century saw re-emergence of Buddhism and even today some of the famous pilgrimage sites in India & Nepal related to Buddhism attract large number of devotees and visitors every year. Most of them are situated around the River Ganges. The significant sites to be visited as great Buddhist centres are Lumbini, Bodhgaya, Sarnath, Shravasti, Kushinara Sankashaya, Nalanda, Rajgir, Sanchi stupa and other cave temples as in Ajanta and Ellora. Lumbini is the birthplace of Buddha and the site is marked by ruins a great stupa and pillar by Emperor Ashoka. Buddha finally got enlightenment in Bodhgaya, when he was 29 years old, under the Bodhi tree, which seems to have eternal life as it keeps sprouting even after destroyed completely. The Mahabodhi temple and a monastic order looking after the three monasteries are things of interest here. Sarnath monasteries from 3rd century B.C. to the 1st century C.E. are in ruins now. The key factors of Buddhism such as the four noble truths and the philosophy of moderation were taught here. There is Shravasti, where there are several legends about Buddha's miracles said to be performed there and there is Sankashaya, where there are no temples and monasteries but is still a revered place because it was here that Buddha was said to be descended from the Tushita Heaven. Nalanda, Rajgir, Sanchi Stupa, Amravati, and cave temples of Ajanta and Ellora are the preferred Buddhist pilgrimage spots in Buddhist circuit. We are operating Buddhist Circuit Religious Tours and also operating tour with many Buddhist places too. Bodhgaya Buddhist Circuit Religious Tours, LumbiniBuddhist Circuit Religious Tours, Nalanda Buddhist Circuit Religious Tours, Sanchi Buddhist Circuit Religious Tours, Rajgir Buddhist Circuit Religious Tours, Kapilvastu Buddhist Circuit Religious Tours, Vaishali Buddhist Circuit Religious Tours, Samath Buddhist Circuit Religious Tours, Sankisa Buddhist Circuit Religious Tours, The Caves of AJANTA and ELLORA Buddhist Circuit Religious Tours, Kushinagar Buddhist Circuit Religious Tours, Kaushambi Buddhist Circuit Religious Tours, and Sravasthi Buddhist Circuit Religious Tours.